Week two ready for your reading enjoyment. Each of us covered sessions from Social Media Marketing World 2019 this week that had a common thread: be more relatable. So whether that means integrating video into your social media content mix or personally reaching out to fans on social, showing up as the true you and stepping out from behind your logo is vital. Want to understand the journey of taking lookie-loos and turning them into lifelong fans? Read on. First up is my recap on the "pager wearing millennial," Brian Fanzo's talk on How to Turn Your Fans into Influencers. What is fandom? To Brian Fanzo it’s everything. As a die-hard Steelers fan where black and yellow runs deep, he’s no stranger to the concept of fandom and what it means to belong. Check out this throwback selfie of Fanzo and me during the networking party on the USS Midway circa 2017. That’s what fandom is — a sense of belonging. No matter if you’re a die-hard sports fan like Fanzo or like to knit custom Christmas sweaters at local coffee shops, your community exists. Finding your community has never been easier thanks to the Internet and social media, where connections and communities are unlimited. The future of marketing, the present of marketing is relatability. BE HUMAN. What does that mean to be relatable in the digital world? To Fanzo, it’s all about the K.I.S.S. method – Keep it simple, stupid. As marketers, we tend to overthink everything when really it's about staying simple and communicating with our audience and the audiences of our clients in a human way, a relatable way. So, if you want customers to become fans, fans to become influencers, and influencers to become brand ambassadors Fanzo offered a no brainer formula to build that trust. Before we jump into the formula it's important to define the differences between a fan, influencer and brand ambassador. A fan is someone who is often a customer of the brand and toots the horn of the brand by referring it to others. A fan can be someone who loves the brand from afar and admires it and aligns with the core values of the brand and the sense of belonging it creates among others. "Influencers inspire action based on trust...brand ambassadors represent a brand and are associated with the brand, but the biproduct they're known for their link to the brand more so than an action inspired by trust," said Fanzo. 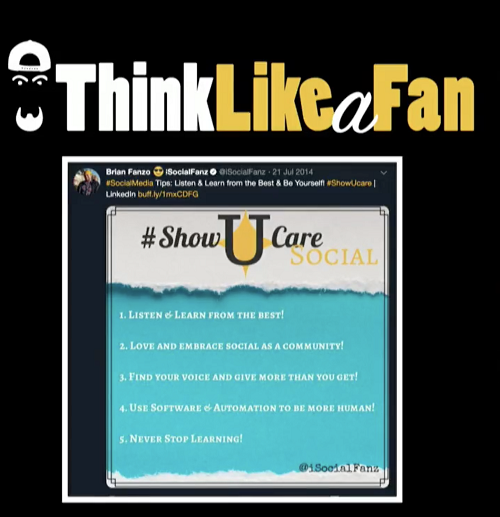 To build trust, the first step is to think like a fan and show you care! Once you’ve mastered these principles how do you apply them consistently? I know I’ve been guilty of this — someone takes the time to craft a comment to my Instagram post, I give a thumbs up emoji or say thank you, however, if someone leaves some shade in the comments section I spend 20 minutes crafting the perfect response. Fanzo says flip this mindset – love it! Just taking the time to create a personalized and conversational response engages that fan and makes them feel connected to the human you. This connection often begins building a relationship of not just likeability but trust. Taking this simple action of acknowledgment also starts to move the needle from customer to fan and potentially fan to influencer. In addition to his love of the Pittsburgh Steelers, he also showed up to his session as a fan (t-shirt and all) of the Dax Shepard podcast, Armchair Expert. Fanzo ran a bit of an experiment – he tweeted about every single episode of the podcast to see if he would get a reply from Dax. The result, every single tweet had a response. Every.single.one. If you’re having trouble keeping track of all those @ mentions and comments getting a third party social media listening tool could assist with not just monitoring the interactions and connections, but also crafting responses all in one place. How are you going to be more human in your acknowledgments and engagements of your customers and soon-to-be fans this week? Let us know in the comments. 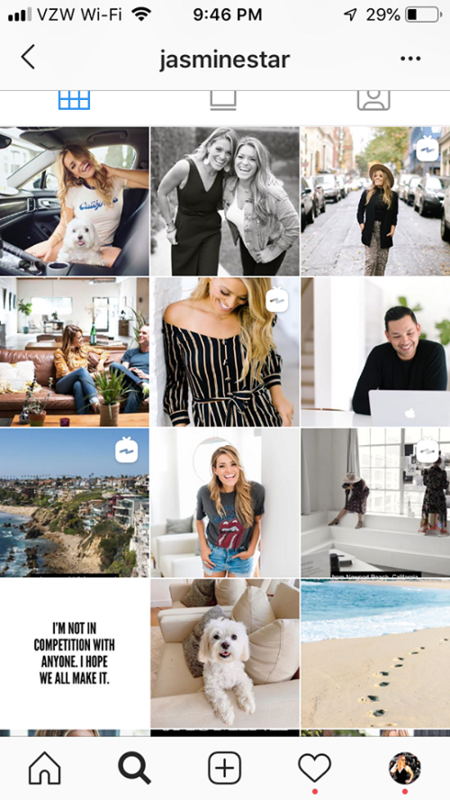 Next up, Cathy Kaczmarczyk of alt-content covers Instagram expert, Jasmine Star's, thoughts on vanity metrics and turning your followers into customers. Jasmine Star walked out on stage and said “The secret to growing on Instagram is to STOP GROWING”. This statement might have turned a few heads in the audience, but many of us Instagram lovers know how important it is to ignore vanity metrics (number of followers). The real question is, why should we stop growing? Jasmine goes on to explains that if you can’t turn your current followers into customers, why keep growing them? We need to analyze who is following us and build on those relationships first. The first step to getting customers on Instagram is to get to know your followers and they will eventually tell you what they want! It is important for organic growth that we get to know our followers and build trust. Your customer also wants to be known, seen, and heard. So how do we make that happen? We know that photos and copy are very important, but ENGAGEMENT is key. When followers comment or even like your content, how are you responding? Not only should we be commenting back on our posts quickly, but we should be starting conversations with other accounts as well. An easy way to start conversations on Instagram, is through commenting on photos (make sure it is 4+ words to be considered engagement). However, according to Jasmine the most powerful tool on Instagram is Direct Messages. Direct Messaging is an important, secret weapon for turning your followers into customers. So, what are ways we can send direct messages to building relationships? Simple conversation starter - “Hey I see you just adopted a puppy! That is so great, congrats!” or “I love your Instagram aesthetic, you take amazing pictures!”. Say thank you for a follow, comment, or even like! If someone see’s that you take the time from your day to do this, it could be a game-changer. Give something. This is the ultimate DM that won’t do anything for your business, only start that connection. An example would be “Hey I see you are visiting San Diego! A great Instagram worthy spot is Holy Machata in North Park. Plus they have some amazing drinks/food!”. Overall, Jasmine hit the nail on the head with diminishing vanity metrics. Accounts with 10,000 followers and little engagement < Accounts with 200 followers with higher engagement. The latter is turning their followers into customers. This recap you're not going to want to scroll past! Amy Airom of Capitalize Social Media highlights some key points from Mari Smith's opening keynote...are you noticing a pattern yet? Let's get into it! The “Queen of Facebook” reigns again with another Social Media Marketing Keynote in the books! Not only is she just a wealth of information, she is the nicest, kindest person you could ever meet! I had the pleasure of meeting Mari at the Facebook Community Boost event in San Diego this past August again with her husband Chris by her side. They are such an inspirational duo and had to capture a photo with them together! Mari always hits us with the truth in the kindest way and with lots of humor. And funny enough, one of her first questions was “Raise your hand if you have a love-hate relationship with Facebook.” And Mari raised her hand, too! As marketers it is no small task to keep up with the continuous changes that Facebook makes to the newsfeed algorithm and how people engage on their platform(s) (remember Facebook owns Instagram, too). Although, as I’ve always expressed, social media platforms are a place to connect. They were never built with the intention of having business spread their message. With that being said, there are, however, many ways that businesses can connect with their audience in a meaningful way. Mari relates the constantly changing struggle to reach our own audiences to the book “Who Moved My Cheese?” by Spencer Johnson. You have the opportunity to change things around to make it work for you or stop altogether. And as she is speaking to a group of marketers, entrepreneurs and business professionals, the obvious answer is, of course, we’re not going to stop. Start with video - 15 second to 3 mins on recorded video or 7-20 mins when doing FB Live video. Why is Zuckerburg going to a privacy focused model? For starters, to support payment platforms! Mari goes on to say, and show a video to report, that China has become a guide to the future, in the form of WeChat, an all-in-one app which represents Facebook, Instagram, Uber, Messenger, evem including heat maps to show heavily populated areas, integrated scheduling platforms for hospitas just to name a few. Facebook will never be as all encompassing as WeChat but they are emulating the model and exemplify this by the acquisition of other platforms. It’s an amazing opportunity for marketing - we have to be nimble and savvy! So where is the cheese, now? Where is it and where is it going? #1 Video — Facebook is determined to be a mobile video platform. This focus started with Facebook Live and now the Facebook Watch platform. Small businesses have the opportunity to create 15 sec ad break videos to get visibility within the Facebook Watch platform. Facebook’s Video Mission Statement: Create a shared experience and a sense of belonging through video/.” Links get the lowest reach, Video gets the highest! Video is the present and future of marketing. Mari gives a couple of pointers: Focus on the ROI of each post. Create high SHAREABLE content, Optimize for Mobile Consumption. Highly engaging videos tend to be emotional, relatable and tell a story, sometime under 30 seconds. Always have text overlay and captions. #2 Stories — Instagram is Facebook’s new Facebook. With the opportunity for Stories on both platforms, story ads are as inexpensive as they ever will be, right now. Stories gives content creators the ability to show a “peek” into their day without having the commitment of planning content that will stay on the platform indefinitely. Also, the opportunity for private conversations within direct messages is another opportunity for businesses to connect with their audience. #3 Facebook Messaging — Facebook Messenger Chat Bots are the #1 Growth Marketing channel for the next 5-10yrs. 40% of people do not have a preference whether or not customer service comes with a human or technology, as long as it’s the right answer. Instagram Direct Messaging is an opportunity spun off of Instagram stories and will soon to be integrated with WhatsApp & Facebook. By 2020, 85% of customer interactions will be done through self serve options and chatbots. The opportunities are endless in the ability for businesses to use chatbots on your business Facebook page. And this is still organic marketing, folks! #4 Facebook Groups —As Zuckerburg continues to convey, he wants Facebook to be a platform where people come to connect and feel a sense of belonging. Facebook Groups has long been an opportunity for private connections and community-based relationship building. But don’t think Facebook won’t see Groups as an opportunity for ads, we’re sure to see them in Facebook Groups in the next year. BellaVasta did an amazing job explaining Facebook Groups in her session by laying out the foundation of what an engaging Facebook group looks like and why people join and create groups. I loved her title “How to get your Facebook Group posts to show up in the Newsfeed” because it was exactly the opposite of what you would think. “You don’t!” You create engaging content and opportunities for group members to connect and engage within them. Bringing it home this week is Mary Fain Brandt of The LinkedIn Bakery. Mary took a deep dive into YouTube which follows suit with our theme for the week of being relatable. What better way to relate to your audience of prospective customers and clients than through video, right? But did you know that YouTube can be a viable business model? Take it away, Mary! I’ve been thinking about my YouTube channel… even uploaded my Facebook Live Shows, but there is so much more to it then just uploading your videos. Luckily for us, Nick Nimmin breaks it down for us in his session on YouTube. 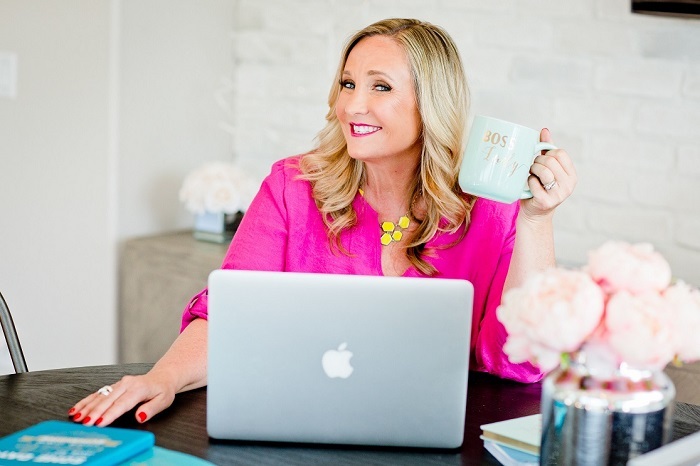 In this recap I will share 3 areas for you to focus on. Let’s start off with what understanding what your goal is with a YouTube channel. Is your goal to sell something on YouTube or to gain followers? If selling is you goal then you’ll want to study those metrics vs. your views. ﻿There are 7 key areas on your YouTube Channel that you need to optimize. Creates visual authority and build trust inside of YouTube. Keep your branding simple and consistent. Use the same font, style and colors. This creates consistency and it trains your viewers what to look for! Share your YouTube channel with us here so we can learn more about you. You can watch previous episodes here .